Border Watch is a village with an inn between Bravil and Leyawiin (quest-related). It is a Leyawiin-styled settlement occupied entirely by Khajiit who have a superstitious belief in the "K'Sharra Prophecy". The Border Watch Inn can be found in the southwest of the town and is famed for its large collection of cheese, including the rare Olroy Cheese. Many houses and their surroundings are in complete disarray, with furniture knocked over, various items littering the floor, and pictures hanging in unusual locations. 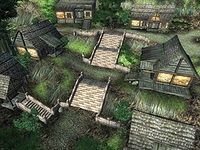 The village's sheep will need to be killed during the related quest. 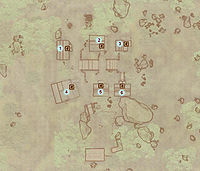 Several of the burning dogs that fall from the sky during the related quest may survive the ordeal, and will aimlessly wander the town afterwards. Esta página foi modificada pela última vez à(s) 01h56min de 30 de novembro de 2014.